You keep them on track. They keep you on track. Daily is ideal but definitely weekly is a must. This can be a quick email or text or phone call….whatever works best for the both of you. You are NOT alone … far from it. MOST actors feel frustrated from time to time. Luckily, there are countless groups and organizations for actors in Los Angeles . And if you live in a smaller market that does not have a lot of actor support… be are part of online groups, and read articles like this, and start your own group of proactive actor friends. If you have an appointment with yourself to send emails, or make phone calls, or work on a project, you can easily cancel on yourself…because really….who’s gonna know? But if you set something solid on your calendar like an acting class that you paid for, or a practice session with friends, you will be a 100 times more likely to “Show Up” to work! And you will always feel better when you have accomplished something for your career. One of my main principles in my career has been “Put it on the calendar!” and then figure out how to make it happen! A coach can be a mentor, teacher, friend, accountability partner, information resource, and career catapult-er (I know…not a word) … all in ONE! Almost every successful person has had coaches in their life. One of the best things you can do for your acting career. Everybody who has gotten anywhere in an acting career (or in life in general) has had some help at some point. I would also recommend being a mentor to another actor who might be newer to the biz than you are. No…seriously. This one is so easy that most people reading this won’t do it. But please …just do it. This is guaranteed to provide a happy shift change automatically. Sending out good vibes to the world comes right back to you like a happy boomerang. 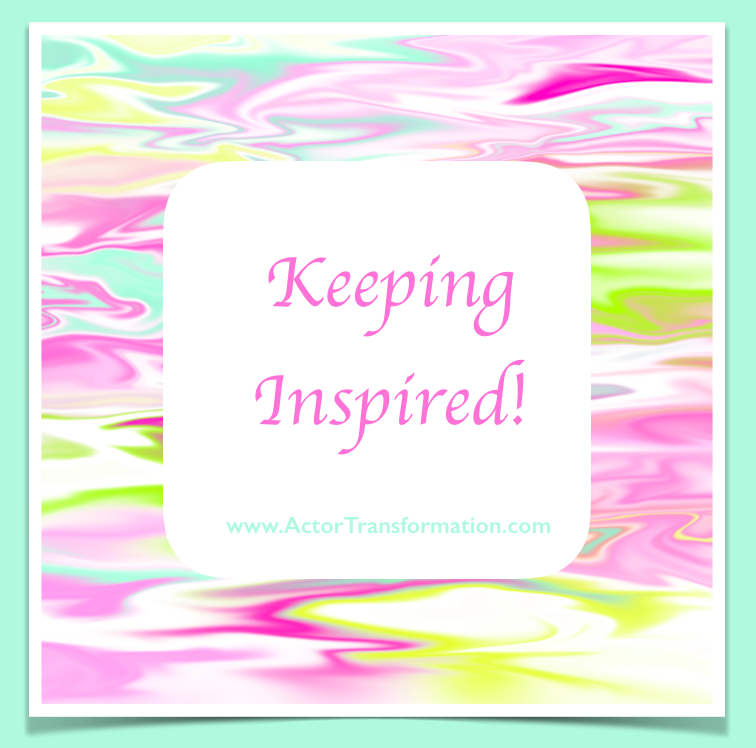 Heck… nowadays, all you have to do is just Google “Inspiration” and you will have an endless stream of positive messages. So make sure you search them out so the negative messages don’t have a chance to seep in. These are just a few ways to stay inspired when your career is having a lull. Please create your own too! Find ways to stay inspired and find ways to inspire others. That is after all…one of the reasons we became actors in the first place!